Chasing the almighty dollar, which goes against the teachings of his daily life as an aspiring Rabbi, Sammy Gold (Jesse Eisenberg) follows the advice of his neighbor Yosef (Justin Bartha) in “working for the medical business.” When traveling to and from Amsterdam for business, he learns Yosef's rules for fellow Hasidic couriers carrying medication for “rich people.” Namely, he's told: pretend you don't know each other on the plane, don't open your bag for anybody, think of it as a game and above all, act Jewish. It's only after tiny bags of pills are hidden in his hat, underneath the ripped fabric bottom of his suitcase and his return flight takes him to New York by way of Brussels and Montreal that Sammy Gold realizes the “medicine” that opens up a rich person emotionally is none other than ecstasy and he's just become a drug smuggler. A fascinating if by-the-numbers predictable interpretation of the true events that shook the Hasidic Jewish community in 1998-1999 when a small Brooklyn, New York smuggling ring was responsible for bringing roughly a million tablets into the country, director Kevin Asch's Holy Rollers is bolstered by the likability of its ensemble cast and the authenticity and compassion for the people worked into his feature debut. Anchored by the guileless portrayal lead Eisenberg (Roger Dodger, Adventureland), Sammy becomes seduced by the fast-paced illegal lifestyle of free Nike sneakers and beautiful blondes like Hebrew school dropout Rachel (Ari Graynor) who's hooked up with their charismatic boss Jackie Solomon (Danny A. Abeckaser). Furthermore, the film is carried very well by its committed cast. And this achievement is evidenced by the fact that – even in underwritten roles – we genuinely care about those we see onscreen out of the closeness depicted instead of the closeness forced in most drug sagas. 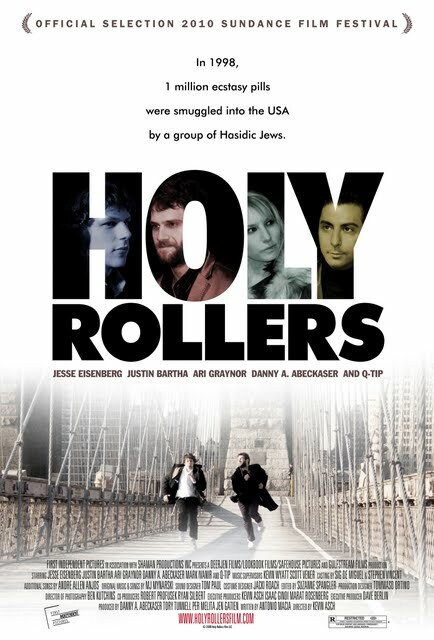 While inevitably Sammy gets in too deep and becomes lost in this new unorthodox (religiously and naturally) world, which is not something that comes as a surprise to any viewer remotely familiar with the genre, Holy Rollers manages to remain compelling throughout. 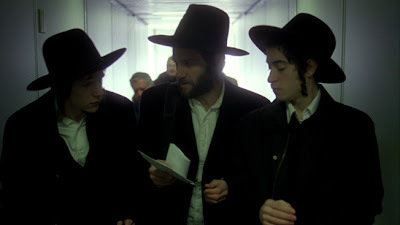 Despite this, however we wish at times that director Asch had been a bit more ambitious with his storytelling to work in actual subplots and backstory to bring us further into both sides of the Hasidic community during this tumultuous time when airport security screeners didn't think twice about letting those who act Jewish and unfamiliar with fellow Hasids from the same plane walk right on by.